Halloween is just around the corner and there is miniature versions of chocolate bars everywhere! Even though I'm trying to avoid them that doesn't mean I still don't get a killer sweet tooth! These banana slices are ridiculously easy to prepare and they definitely hit the spot! And to top if off you get a healthy dose of potassium, protein and fiber! 1. In a small bowl combine chocolate chips and peanut butter. Microwave for 30-45 seconds, stirring every 15 seconds until melted. 2. 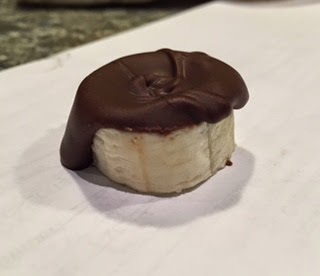 Using a small spoon drop melted chocolate and peanut butter mixture on to banana slices. 3. Place slices in the freezer for 15-30 minutes until frozen.